Vacaville families need housing that they can afford. The current median wage for a Vacaville family is $74,000 while the median housing price is $470,000. If you do the math the average Vacaville family would have to pay 55% of their monthly budget just to afford their home. Only 60% of Vacaville’s housing stock is owner occupied. Home ownership is the cornerstone of building a families financial future. We can do better! Nolan believes we must update the way we issue permits and incentivize developers to build smaller in-fill development projects that young Vacaville families can afford. By building homes that help young families start their equity journey we are able keep Vacaville families in town and spur economic activity as families build equity and buy up to larger and larger homes. housing development have not exhibited that respect. Leisure town residents were invited to be part of the process and came up with a plan that worked for their very unique community. That plan was scrapped without notice and our senior neighbors in leisure town have been left in the dark. Leisure town residents deserve neighboring housing that is senior friendly, has walking trails, park amenities, a dog park and more much needed senior housing. City leaders need to hold developers accountable to the needs of residents and guard against any development that would be detrimental to our senior’s lifestyle or property values. People over profits. Every Vacaville family deserves a safe home that meets their needs with a payment they can afford! colleges with a 4 year bio-manufacturing degree right next door. We should be the “Silicon Valley” of bio-tech. We have ample land that already has infrastructure for this type of business. Significant training facilities for staff and are located at the nexus of two major shipping corridors; I80 and I505. We need a vision for the future, to support and grow our economic development staff, create an environment that fosters entrepreneurs in the bio field and to market ourselves as the best location for a bio-business in the State. Nolan knows we can do better. We need to stop courting low wage employers and start going after businesses in the bio and ancillary industries that pay living wages for their workers! Vacaville needs a balanced budget with built in stability and assurances for our city employees and future residents. Nolan believes we need strong fiscal leadership that is transparent, responsive and educates the community. For a city with robust revenue sources like Genentech (the largest tax payer in the region), the outlets (a major sales tax producer) and 1000’s of new homes on the market at high price points (bolstering property tax revenues) we should not be relying on increased taxes to support basic city services. We can do a better job managing our money and spend Measure M revenues where they were intended; roads, facilities and parks for our residents. We should not be deficit spending on permanent expenditures while propping our budget up with a temporary tax. to address those long term obligations. We need fiscal leadership, transparency and problem solving. We should be bringing in experts to help our city leaders navigate murky financial waters. We have community experts on the Planning Commission and Community Services Commission to advise city leaders on building and parks. Nolan would follow suit and create a Budget Commission stocked with accountants, auditors, financial professionals and representatives from our bargaining groups to use their expertise to help the city craft a plan for our financial future. Advocating for local parks and recreational facilities! As a past commissioner for Vacaville Community Services Nolan knows the importance of great local parks for Vacaville families and seniors. He also knows that we need to invest in our parks and expand offerings as our town grows. Nolan will be a champion for local quality of life issues! Leading as a local volunteer! Nolan has spent the past decade “on his own time and his own dime” volunteering for Vacaville whether it be leading the Vacaville Public Education Foundation, working on Measures I and M or working with local Boy Scouts Nolan is committed to leading through service in Vacaville! A Voice for Vacaville Families! Nolan Sullivan is running for Vacaville Families and Seniors. 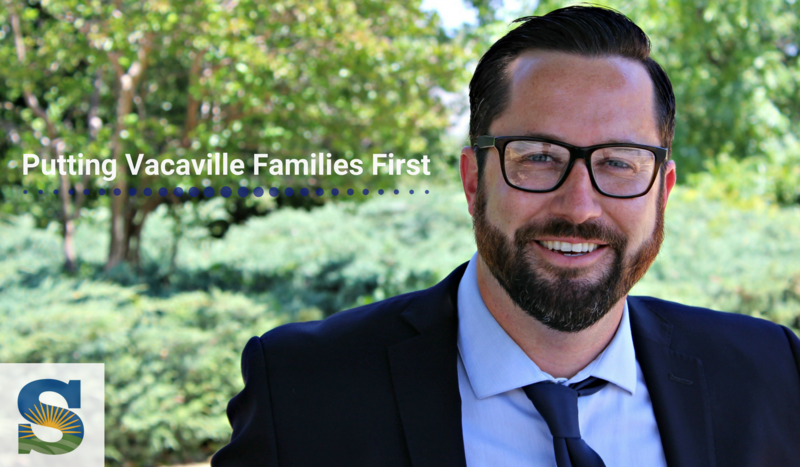 He has a young family himself and a vested interest in Vacaville’s future! Nolan’s family is 5th generation Vacaville. He has deep roots in our community and is respectful of Vacaville’s past and committed to it’s future. Vacaville Seniors and Families deserve affordable housing! The median housing price in Vacaville is $445,000 and the median wage is $72,000. There is a huge disconnect between what housing costs for Vacaville residents and what they can afford. We can do better. Vacaville Residents deserve good local jobs! Vacaville is not just a commuter town, it is a town poised to attract major new employers and great paying jobs for it’s residents. Vacaville residents deserve good paying jobs right here at home!